Carole Mitchell: Our next speaker is Dr. Kevin Brown. He's the Assistant Professor of Otolaryngology and Head and Neck Surgery at NY Presbyterian Weill Cornell Medical Center. Thank you so much. (Applause). Dr. Kevin Brown, NY Presbyterian: First off, I'd like to thank the organizers for inviting me to give a talk here. Unlike sort of a general neurosurgical overview, I am an otolaryngologist that specializes in neurootology. We work with neurosurgery, but we work specifically on vestibular schwannomas. We have a specific interest in both facial nerve function as well as hearing. I'll talk about predominantly the hearing in this talk today. In speaking about the surgical treatment of NF2, I broke this talk up into four major parts. The first is a little bit of introduction and background. This is done towards understanding why some of the treatments are good ideas, and why some of the treatments are not. We're also going to talk about factors and treatment choices, sort of how we approach patients that have NF2. We'll talk about what those treatment choices are. Finally we'll talk a little bit about the surgical rehabilitation of hearing loss. This is a little bit of a review from some of the talk that Dr. Yohay gave this morning. NF2 is autosomal dominant, penetrance (The percentage of individuals with a genetic mutation who exhibit clinical symptoms. ), is very high. Typically presents in patients in their second to third decades of life. 50 percent of these cases have no prior family history. Spontaneous mutations. We've already gone through the criteria for diagnosis. The condition is due to a mutation in a gene called Merlin. Sometimes you'll also see it called schwannoma. The mutation affects the growth of Schwann cells that surround nerves. This protein encoded by the gene interacts with another type of protein on the surface of cells called integrins. These integrins are responsible for basically telling the cell that it is touching another cell. When this protein is mutated it affects the ability of the cell to understand that it has neighbors around it and it continues to grow when it shouldn't. Truncation mutants of this gene which means that the gene has a shorter protein than it should be, typically leads to more severe disease phenotypes while missense or change in the code of the gene or splice mutations lead to milder forms of the disease. 1. What are Schwann cells? What are Schwann cells? This was spoken about a little earlier. But they're basically these cells that line the outside of an axon, or as Dr. Yohay mentioned, the electrical cable. By insulating those, it enables information to pass through it faster. This is what the Schwann cells look like if you look at them in section. You see these little dark spots here, this is actually the nuclei of the Schwann cells. You can see the axons traveling through here. What's interesting with the Merlin gene, what we see is that in cell culture if you take these Schwann cells and look at the localization of Merlin in cells that are growing, in this case you see them, they are subconfluent which means they have space to grow, you see the schwannoma naturally gets localized to the outside of the cell. So it's getting pulled to the cell's surface. It gets colocalized there with a growth factor called erb 82. You see they're colocalized because red and green make yellow and we keep the tumor together in that location. When the cells become confluent, meaning there isn't any more room to grow, in the normal situation the Merlin actually becomes localized, what they call perinuclear location. It sort of gets drawn back into the cell and away from the cell's surface. That should be the normal situation. But in patients that have a mutation in Merlin, or if you remove or mutate Merlin in these type of cells, which you see happening, is that the Merlin remains localized to the surface of the cell, and this abnormal localization leads to continued proliferation of the cells. This was just a brief schematic that shows this. As we had talked about, these integrins are on the surface of the cell and these are in part responsible in part for telling the cell that it's next to another cell and not to grow anymore. If there is a mutation in the schwannoma gene, this interrupts a signaling cascade that enables the cell to make this determination. 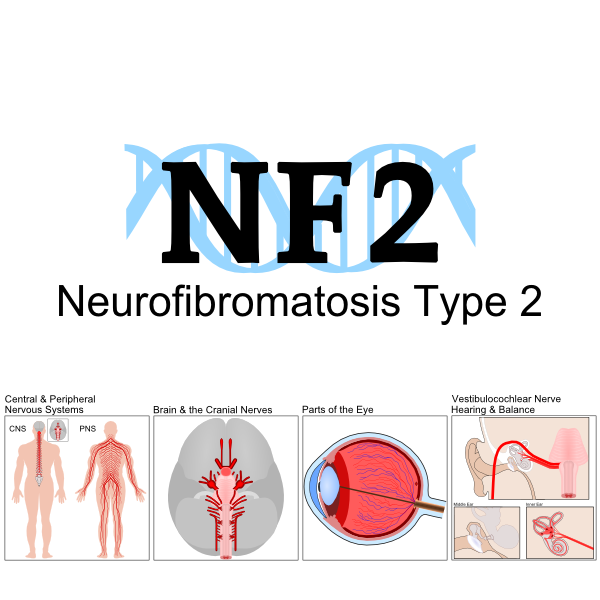 Just as a final part of the background, there are two phenotypes that have been described with NF2. There's the Wishart phenotype characterized by multiple cerebral and spinal lesions, typically in patients under 20 years old. And there tends to be rapid progression of these tumors. Then there's the Feiling-Gardner phenotype which is characterized by single central tumors with slow progression. Just so people can understand it, I thought it would be helpful to go over a little bit of background on anatomy. This is obviously the external here. We have the ear canal here. Ear drum. And then this is what we refer to as the middle ear space. You see the hearing bones here. And this then leads to the cochlea. This is then the balance system here. All these chambers have fluid in them. As your head turns and you move, the movement of fluid within that enables you to determine change in direction. Off of this structure is something called the internal auditory canal. You've seen a couple of pictures already on MRI scans and I'll show you more in a second. Within the canal there are actually four nerves that are traveling. The facial nerve, two balance nerves (interior and exterior vestibular nerve), and then there's a cochlear nerve that permits hearing. This is a normal MRI scan, no tumors on this one. But one of the things you can see is the tunnel right here, and you can see actually the nerves traveling through that tunnel. This is the internal auditory canal. You'll hear people sometimes talk about the cerebellopontine angle, or the CPA for short, that's this structure. It's sort of in that angle between the cerebellum here, the ponz, and then you can see some of the inner ear structures as well. This is the cochlea, and part of the balance system. This region is where the vestibular schwannomas tend to form. You can see that this is a patient that had a spontaneous vestibular schwannoma. It's a small one. But you can see how it develops within the internal auditory canal. Once it develops in this region, if it is a growing tumor -- not all tumors grow -- then it starts to make its way out into the cerebellopontine angle. The histology of Neurofibromatosis Type 2, vestibular schwannoma can be variable. Basically it has this loose organized collection of Schwann cells in it. It has a very sort of nondescriptive appearance. The thing that's different about vestibular schwannomas and Neurofibromatosis Type 2, and it's actually important as we consider options for doing things like hearing preservation surgery, is that these tumors tend to be more invasive, meaning they have a tendency to grow into things. Normal run of the mill vestibular schwannomas don't tend to do that. This was a study that came out of the Housia Group. What they demonstrated was unlike a standard schwannoma you see on the left side, where the nerve is on the left side, you can actually see nerve fibers within the tumor itself indicating the tumor has grown into that nerve. This is an example from Sam Merchant who was up at Mass. Eye and Ear. What they demonstrated is not only is there invasion into the nerve itself but there can be invasion into structures of the inner ear. Here they're showing that this is the cochlea, the different chambers of the cochlea. They're showing that there's actually invasion of the tumor up into the cochlea. In fact if you look at this example here, you see the entire cochlea is filled with tumor. This can be a very early type of hearing loss even with small tumors. As we look at patients that have Neurofibromatosis Type 2, and start considering whether they have schwannomas or not, the initial part of the diagnosis is based on history. Hearing loss is a very common presentation, about 98 percent of patients will have hearing loss. Tinnitus, sound of ringing in the ears is also a very common symptom. Imbalance, dizziness, headaches, facial numbness and facial weakness are additional symptoms patients have. For the diagnosis, we do a complete head and neck exam, careful cranial nerve exam and we do an evaluation on balance function. One of the critical components of determining when to consider surgery for a patient has to do with the hearing test. I felt it would be appropriate to take a few minutes to help everyone understand exactly what a hearing test measures. As we're looking at a hearing test, as you go from the top of the scale down, we're using increasingly large amounts of volume. What is considered normal in an adult patient is this level right about here, which is about 25 decibels. Above that would be normal. The frequency increases from this side of the scale to this side of the scale. So we go from lower frequencies to progressively higher frequencies. One of the other things that is critically important is the speech understanding. This is given as a scale down here where the patient is given a list of words and they're asked to repeat those words back. Based on the percent number of those they get correct, that's what's given as the speech discrimination score. Patients that have Neurofibromatosis 2 are followed on a pretty consistent basis about every 6 months with hearing tests. A couple of other things that are important to consider with respect to hearing is what constitutes useable. Patients can lose hearing but they can still be potentially aided with a hearing aid which is something we'll hear about in a bit. But exactly what constitutes useable hearing is a matter of debate. Typically a speech understanding greater than 50 percent is necessary to permit using a hearing aid. This doesn't account for using sound for aiding a patient in either lipreading or using nonverbal cues. Another term that you'll sometimes hear is something called open set recognition. This refers to the ability to understand a word when you don't know from a list what that word could be. Closed set means there's a list of words to choose from. An MRI is critical for making the diagnosis. We've seen several of these so far. Schwannomas enhance markedly with contrast. You can see bilateral schwannomas on this patient. MRI's are also necessary to screening first degree relatives. It's important for observation strategies. And also for post operative monitoring. As was mentioned, there's a very high risk of developing additional schwannomas. The make up of the team was already discussed. But specifically as it relates to vestibular schwannomas, there are really three critical components. There's a neurologist who coordinates care between the specialists. There's a neurootologist which is somebody like me and Dr. McMenomey who will talk here in a little bit, who follows hearing over time and is involved in surgery for tumor removal. We're also very directly involved in hearing rehabilitation. The neurosurgeon is also going to be critically important. They're part of the team for the surgery for tumor removal, and they may also assist with ABI placement in the patient if they end up in that situation. I think it's really important that the patient has to be very comfortable with the team because we're talking about very significant life-altering decisions everyone is making. What are the factors we think about in determining treatment? First the presence of normal or habilitable hearing is critical for determining the timing of surgery. As Dr. Golfinos mentioned in his earlier lecture, hearing is normal, it's perfectly reasonable to consider observation. There are two caveats. Number one, if you have a rapidly growing tumor you may want to consider acting earlier in as much as that would be the possibility of doing hearing preservation surgery will be lost. If it is an only hearing ear, even with a growing tumor, we'll tend to avoid surgery either until a pending complication occurs or until functional hearing is lost. Tumor size as well as growth of the tumor is another critical factor. Smaller tumors which we typically consider less than two centimeters may be observed. Larger tumors, greater than two centimeters with significant stem compression needs surgery to prevent complications of hydrocephalus or brain herniation. Growing tumors, particularly rapidly growing tumors, need surgery because as the tumor enlarges, our ability to preserve hearing as well as facial nerve function becomes progressively reduced. The different treatment options that are available are observation with serial MRI scans, radiotherapy, hearing preservation surgery by either a middle fossa or a retrosigmoid approach. Which I'll talk about in a minute. One option that has been brought up by the Housia Group is decompression surgery of the internal auditory canal, and we'll talk about that. And then there is nonpreservation, nonhearing preservation surgery by a translabyrinth approach. The first of these options is observations. After an initial diagnosis is made on small tumors in patients with good hearing, it's perfectly reasonable to consider serial imaging to determine the growth rate of the tumor. On average, the growth rate of a vestibular schwannoma in a patient with NF2 is approximately two millimeters per year. If the tumor does not change significantly in size, you may continue to observe. And we typically do MRI's every six to twelve months depending on what the previous rate of growth has been. If the tumor grows or hearing is lost you should consider surgery to prevent further complications. Advantage of operation is pretty implicit. If you don't have surgery there's no risk of any complications. But the disadvantage is you may lose the opportunity to preserve hearing, and facial nerve preservation may be more difficult with a larger tumor. Dr. Golfinos actually talked a fair bit about radiotherapy but I wanted to revisit the topic. There's a really high concern within our field about using radiation on patients that have Neurofibromatosis 2. The reason for this is there's a germline mutation in a tumor suppression gene. Merlin, schwannoma that is coded by NF2 is a tumor suppressor. It allows tumors to develop. This germline mutation is theoretically within all the cells in the central nervous system. By radiating those cells you have taken a situation where you have one potential genetic hit that predisposes toward development of the tumor and now add a second hit or potentially multiple hits. There's limited studies to date. The largest series I could find with relatively short-term follow up of only five years indicates the risk is approximately two percent. I suspect that will grow significantly as the patients are followed further out. And in some of the shorter smaller series, it was as high as ten percent. The five-year control rate for patients treated with radiotherapy is much lower than conventional schwannomas. It's probably because the nature of these tumors is to grow. The five-year control rate has been 66 to 80 percent depending on the study. The hearing preservation rates with radiation also tend to be much lower which is a critical thing to consider if the patients are considering cochlear implants or ABI's. As can frequently happen with patients that have received radiation for a schwannoma and NF2, the radiation itself can make removal of the tumor while trying to preserve nerves much more difficult because the radiation leads to fibrosis and it can obscure the natural dissection plane progression between the tumor and the nerve. The hearing preservation option is something called the middle fossa approach. This is typically used for smaller tumors that are in the neighborhood of less than a centimeter and a half in size. The approach is from above, and the IAC, you'll see in a second, is approached from above. The limitation is that it gives poor exposure of the cerebellopontine angle as we get closer to the brain stem. As we get closer that's why there's a restriction on the size for this technique to be used for. Just as a point of introduction, this is the side of the head. Ear is over here. The temple lobe to the brain is lifted up and this exposes the area of the internal auditory canal. The canal is then unroofed, utilizing a drill, and then you can see tumor within the space with the facial nerve draped over it. The tumor can then be removed while preserving facial nerve and the hearing nerve. The retrosigmoid approach -- and if we have time I'll actually show a video at the end, there's really not a limit on tumor size if hearing preservation becomes more unlikely if greater than two centimeters in size. It gives excellent exposure of the internal auditory canal as well as the cerebellopontine angle. There is an increased risk of post operative headache afterwords. This is our preferred approach at Cornell. As I mentioned, if we have time I'll show a quick video on this. Basically what is done with this procedure is that an opening is made behind the ear. The section is carried over the internal auditory canal from behind. The internal auditory canal is open. The tumor is removed from that canal. And then the mass of the tumor is then removed as well. This is a video of the retrosigmoid approach. I'll show you real briefly here. This was the smaller tumor that you saw in the previous MRI scan. We have the spaces that we're looking at, the cerebellopontine angle here, the internal auditory canal here. We're seeing a little cochlear nerve here, the facial nerve underneath it. We'll see the facial nerve in this direction. The tumor on top of this, and the tumor is slowly being dissected off. The movement you're seeing here is the microscope being adjusted. We're gently starting to sweep away the tumor from the canal. And we're going to see the hearing nerve underneath. You can start seeing a little bit of it right here. This is a very delicate sort of elegant surgery. Sort of in the interest of time I'll keep going. I thought it was important for everybody to see what the surgery actually looked like because I think everybody sort of gets this impression that it's brain surgery, it's bloody and messy and everything. It's actually a very elegant operation when it's done correctly. What are the results with hearing preservation surgery? Doyle et al in 1993 used the middle fossa approach in patients with vestibular schwannomas and NF2, and they maintained hearing in five out of twelve patients. Friedman et al also described his results and said they were able to maintain class A or B hearing which is considered functional hearing by most people. It was maintained in 50 percent of cases. This is less than what we are typically able to get with patients with the sporadic or acquired form of vestibular schwannomas, which is around 70 percent. The reason for that difference is probably related to the slide that I showed before. These tumors do have a likelihood of evolving and invading into the hearing nerve. Decompression has been suggested as an option. This was a paper published in 2011. This was reserved for patients that had hearing in only one ear but had a growing tumor. For those patients, they would decompress the internal auditory canal to relieve the pressure on the hearing nerve. In patients that had this done, which there were 49 patients, 90 percent had short-term hearing preservation. But the period of preservation was only on average 2.1 years. This is a temporary fix, doesn't prevent hearing loss. Just alleviates the hearing loss for a period of time. For patients that have lost hearing, really the preferred approach is a translabyrinthine approach. This is done behind the ear but a little closer to the ear than the retrosigmoid approach. It gives you excellent exposure to the internal auditory canal and the cerebellopontine angle. It gives you the best possible control of the facial nerve because you find it very early in its course and you could trace it from that point to the tumor. It also gives you the best angle for placement of the auditory brain stem implant. And it also permits the placement of the cochlear implant because you can utilize the same incision. This is a brief schematic of the translabyrinthine approach. What you see here is this area has been drilled out. This is the ear canal right here, and this is the mastoid cavity that has been drilled out. This is the sigmoid sinus. The facial nerve would be running right about here. And then it makes a loop and comes back and goes down deeply towards the brain stem. In this case the bone in this area is removed, utilizing a drill. We get progressively more exposure until we get down into the internal auditory canal. The dura of the internal auditory canal is opened, as is the dura overlying the cerebellopontine angle, and the tumor within this region is then removed. There are a few surgical options for hearing loss that are worth discussing in patients that have NF2. The Baha is an excellent option for patients that have lost hearing in one side. The way it works is that it routes the vibration of sound from the side you can't hear from to the side you can hear from. This improves speech, understanding and noise (inaudible) and may improve sound localization. And in general terms, it reduces the empty or dead feeling that patients have when they lose hearing on one side. The cochlear implant has really been a very exciting development for us in the treatment of patients that have hearing loss in NF2. The way a cochlear implant works is it basically replaces what your ear normally does. What your ear does is it converts the mechanical vibration of sound in an electrical signal. A cochlear implant does the same thing and very well. The way it works is there is an implanted device that is placed underneath the skin next to the skull bone. An electrode, you can see it curled up here, is then placed within the cochlea. A sound is picked up by a processor that looks like a hearing aid that sits on top of the ear and that information is then transmitted through a head piece through the skin to a piece underneath, and that electrical signal is placed into the cochlear nerve and the patient is then able to hear. The cochlear implant results have been extremely encouraging. The caveat to this is the cochlear nerve has to be maintained in tact. Welling et al published his results. Five out of six patients had good open set recognition after cochlear implant implantation. Driscoll at Mayo reported his results, six out of ten patients with good open set recognition and two out of ten reported improved voice and lipreading, and environmental awareness. Today 31 cases have been reported in literature for patients with NF2 that have gotten cochlear implants after micro surgical resection after the tumor and 65 percent of those have achieved open set speech recognition. This is far superior than what we have been getting today with published literature with the auditory brain stem implants. Auditory brain stem implants are for those patients that have lost the cochlear nerve. There's no way for information to be transmitted from the cochlea to the brain stem. Basically the way these work is similar to the implant. There is a component placed underneath the skin that communicates with an external processor. Then an electrode is placed in proximity to the cochlear nucleus. That electrode is able to stimulate that. You can see an ABI placed here to the electrode running here, and then the tip of the electrode next to the cochlea is to the brain stem. The results of this have been published. Sanna et al in 2010 described 23 patients implanted with ABI, 19 still using the device. 8 had some speech recognition, but only four of these patients had good speech recognition. It's generally thought most patients with ABI will have sound awareness and closed set recognition only. You remember, closed set is if you have a list of words, you can pick out words. There certainly are exceptions. Recent data may be more encouraging as there has been some talk from a group from Italy that they're achieving higher levels of hearing with their patients. In conclusion, vestibular schwannomas are a major cause of potential morbidity in patients with NF2. It's important to realize there are multiple surgical options available for managing schwannomas. The timing and type of surgery are decided upon between patient and surgeon. It's based on hearing levels, tumor size, patterns of growth, and patient preference. At the end of the day it's the patient's decision on what route they want to pursue. If hearing is lost, there are multiple surgical options available to rehabilitate hearing. And in a good NF2 center all those options should be available to you. I'll take any questions. Or do we want to wait for questions? Or questions now? Wait for questions? FROM THE AUDIENCE: What I asked before, the use of implants or cochlear implants prior to the removal of the vestibular schwannoma as a means of hearing preservation. Are there any statistics on how effective that is? What the risks are for somebody who has marginal hearing, and the intent is to make it better and not worse. Dr. Kevin Brown, NY Presbyterian: Good question. A couple of situations have been looked at. Number one, the patient with the completely untreated tumor that has the tumor hasn't progressed to the point where there's an impending complication, brain stem compression, and in those patients getting cochlear implants results have actually been quite good. The other option is in patients that have had their tumor radiated and they lose hearing and those patients have also gotten cochlear implants, the results have also been quite good. The reason this occurs is the cochlear nerve is still intact and has the possibility of still receiving information from the cochlea. It's just that information needs to be amped up for lack of a better word. That's one of the things that a cochlear implant can accomplish. There are some things to consider though. Number one, the cochlear implant can't have the typical magnet that I showed in the slide with the outer part because of the likelihood the patient is going to be getting MRI scans, also the potential complication that as I showed the schwannoma can sometimes find its way into the cochlea. If the schwannoma has caused changes in the cochlea, ie the cochlea is full of tumor; sometimes it's difficult to get the implant in. But if the hearing as deteriorated to the point where they're not able to get benefit from the hearing aid and they still have the hearing nerve, then it can benefit. FROM THE AUDIENCE: Is the worsening of hearing a factor? Dr. Kevin Brown, NY Presbyterian: That is. When we put a cochlear implant in, afterwords the patients have the possibility of losing any residual hearing in the ear. What we can do by doing a very atraumatic technique, we can do a very low frequency. But I think the patient would have to be prepared for that possibility. But the outcome they get with an implant is so far superior. I think it's a good trend. Carole Mitchell: Thank you. (Applause). Carole Mitchell: Our next presenters are Dr. Sean McMenomey. 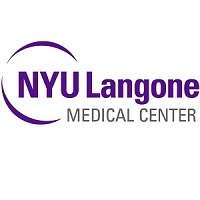 He is here at NYU, Director of otology and neurootology skull based surgery, and also Joe Montano who is the Associate Professor in audiology in clinical audiology -- sorry. He's also the chief audiology and speech language pathology at New York Presbyterian. We'll start with Dr. Sean McMenomey.